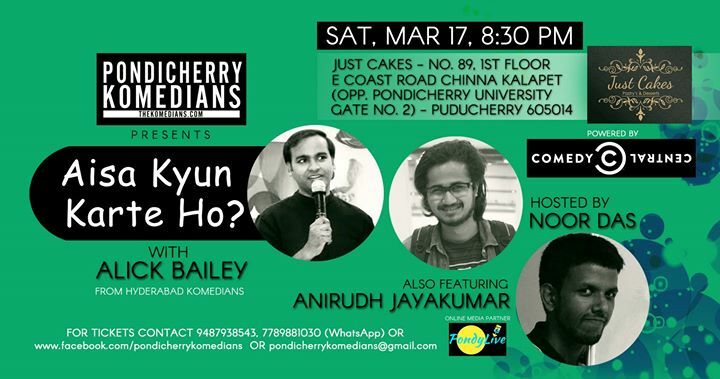 Pondicherry Komedians ft. Alick Bailey's "Aisa Kyun Karte Ho". "Aisa Kyun Karte ho" is the first comedy special by Alick. It is about the stupidity of his actions and of those around him (mostly, his own). Extremely ordinary observations by an ordinary guy on stupidity. Catch him live on 17th March at Just Cakes. Hosted By : Noor Das. Also Featuring : Anirudh Jayakumar. Social Media Partner : Pondy Live. "THE NIGHT IS DARK AND FULL OF LAME JOKES"